The movie tells the story of a young girl, who goes from being a shop girl to a billionaire, after her father leaves her his empire to run. A desperate American dreamer kidnaps her demented father after he cuts her out of his will. Stars: Enyinna Nwigwe, Daniella Down, Banky W.
A disillusioned London chef visits Nigeria and struggles with her matchmaking mother and restoring the family's rundown hotel. She's heartbroken when she discovers the man she loves is buying it. 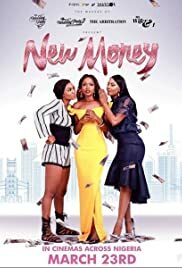 Compared to some Nollywood movies, New money does a great job at introducing each character, setting the stage for the actors and getting the story going. However, just after the true plot is unveiled, the movie takes an unrealistic turn and spirals towards a very impractical and confusing path. The characters we are introduced to suddenly seem different, constantly making decisions we can't help but question. Sadly, we get no answers as the movie dawdles on, throwing in a ton of unnecessary clichés here and there right to the end. The acting is the only thing praiseworthy in this movie. Jemima Osunde, Kate Henshaw and Falz were by far the best performers while the other supporting actors are commendable too. In fact, the cast is one of the constant reminders that you're still watching the same movie, the other being the repetitive soundtrack.